Much to the amazement of the establishment media, President Trump's job approval rating held steady despite former campaign chairman Paul Manafort's conviction on tax and bank fraud charges and ex-personal lawyer Michael Cohen's guilty plea last week, according to the results of two polls released over the weekend. Trump's job approval in a survey conducted from Aug. 18-22 sat at 46 percent, while 51 percent disapproved, a NBC News/Wall Street Journal survey found. A second poll conducted between Aug. 22-25 revealed his approval numbers held steady, despite the legal jeopardy of his associates. The second survey from NBC News and the Wall Street Journal found 44 percent of respondents approved of Trump's job performance, whereas 52 percent did not according to analysis by The Washington Examiner's Naomi Lim. NBC reported that Republican pollster Bill McInturff of Public Opinion Strategies, who conducted this survey with Democratic pollster Peter Hart and his team at Hart Research Associates, called Trump's approval rating "remarkably stable" despite the Manafort and Cohen developments, both of which became public on the same afternoon last Tuesday. The Manafort and the Cohen developments are also solidly on voters' radar screens, so it’s not like voters haven’t heard about the years-old charges against Manafort and Cohen. Asked if they have heard about Paul Manafort being found guilty of multiple tax and bank fraud charges, 46 percent say they have heard a lot, 38 percent say they have heard some and 14 percent say they have not heard about it. Asked if they have heard about Michael Cohen pleading guilty to tax fraud charges, 46 percent say they have heard a lot, 34 percent say they have heard some, and 20 percent say they have not heard about it. NBC reports that percentage makes Cohen and Manafort a big story, but not a huge one. For comparison, NBC says it's about the same percentage overall (around 80 percent of Americans) who had heard about former New Jersey Governor Chris Christie's Bridgegate scandal when it was receiving prominent news coverage, but a smaller share than had heard about the Access Hollywood “grab ‘em by the p***y” tape (95 percent). What the establishment media has never grasped about Trump’s support is that his personal foibles are already baked in the cake. According to exit polls of the 2016 election, Protestants voted for Trump by a 58 percent margin. Meanwhile, Catholics, who normally vote Democratic, favored the Republican nominee by 52 percent. And his strength with white evangelical Christians was reflected in their embrace of him by a staggering 82 percent margin. White evangelicals voted Trump by a 4-1 margin, citing pledges of conservative policies and court picks; and Trump has delivered on those pledges. In the immediate aftermath of the election, white Evangelical Christians said they voted for Donald Trump because of his stances against abortion and illegal immigration and in favor of gun rights and conservative judicial nominations, as well as concerns over the economy and terrorism. Support for Trump was strong among white Christians, especially Evangelicals, despite his failure to meet the personal conduct standards they set for themselves. And support for Trump’s policies hasn’t wavered. Conservative evangelicals' support of and strong representation in President Trump’s administration was voted the No. 1 religion story of 2017 in the Religion News Association's annual Top 10 Religion Stories of the Year Poll. Griffith noted Trump outperformed other Republicans in the primaries, such as Ted Cruz, who publicly identified themselves as evangelicals. She also pointed out the now-President’s robust performance with religious voters came despite efforts by prominent evangelical leaders to make a case against him. Prof. Griffith oberved that Russell Moore of the Southern Baptist Convention, Washington Post newspaper columnist Michael Gerson and several evangelical bloggers all pointed out the moral flaws of Trump during the campaign, as did we at CHQ. However, when faced with the prospect of a Hillary Clinton presidency, and Far Left anti-Christian Democrat control of Congress, we, and most other values voters readily supported Trump. And nothing the Democrats have done since the election has given us any reason to regret that decision. What’s more, as our friend Deroy Murdock observed in a recent column for the Manchester Union-Leader, an Aug. 7 NAACP poll found that 21 percent of black registered voters approve of Trump’s job performance. Even better, in Wednesday’s Rasmussen tracking survey, 36 percent of black voters gave the President thumbs up, compared to 19 percent a year ago. What the establishment media doesn’t seem to comprehend is that Donald Trump’s supporters, conservative, populist voters, not just white Evangelical Christians, stick with him because they want results, and Trump, despite his foibles is delivering them. Submitted by MikeyParks on Mon, 08/27/2018 - 17:15. 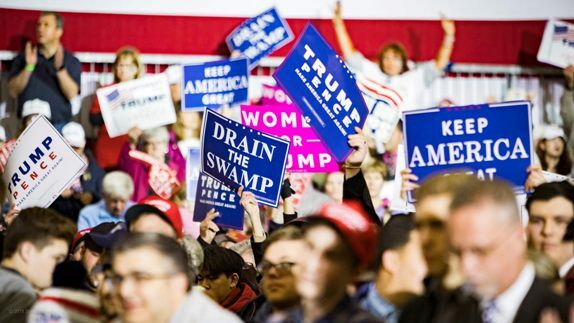 The MSM doesn't realize that we Trump supporters are on to all their dirty tricks; attempted character assassination, false accusations, bimbo attacks, name calling, fake news – all of it and we don't care. We laugh at their feeble attempts to turn us off on the one person who's capable of saving this country. They have no idea how many of us there are. They didn't in 2016 and they still don't in 2018. They'll find out soon and again they'll be shocked and dismayed. And we'll get to laugh at their tear-stained faces. MAGA! Submitted by email_registrat... on Mon, 08/27/2018 - 13:07. I don't capitalize what I do not respect. Has Trump's support remained stable? His base has, but many more have added to it. 400% black and Hispanic entrepreneurship? I'd say he's doing pretty well there. Why? Getting rid of obama's job-killing regulations. This is one of the msm's mistakes, them acting like prima donnas all the time only makes me laugh. The mistake or one is they expect a staid politician, and Trump is NOTHING LIKE THAT thank God. We've all seen how politicians screwed this country up. There are a few other mistakes which are felonies and border on treason, but it's a nice day, why get into that?